This autumn we celebrate 7 years since social argentine tango was first introduced in Iasi! On this occasion Tango Feliz -Iasi - the club that introduced argentine tango to the lovely city of Iasi - organizes several events to celebrate the anniversary. On the one hand, we have workshops for the ones that want to discover more tango secrets. You already know our guest from last years edition, or maybe from their other visits in Bucharest, Timisoara or more exotic locations across Europe: Claudio Cardona and Vito Munoz - two wonderful instructors that have a lot to teach us. We will be partying just like in the fairy tales, for three days and three nights straight! Everybody is invited to celebrate together with us and our guests. More details soon regarding workshop subjects and the locations for the workshops and Sunday milonga. 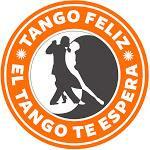 Tango Feliz - happiness from the first step!